It doesn’t try reinventing the wheel and that’s great. 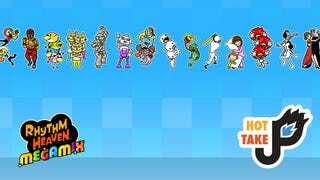 Nintendo has made it a point to flip the tea table with a lot of it’s franchises but, luckily, it seems content to leave Rhythm Heaven be. The mechanics are solid and remain unchanged, so if you’ve played previous games you’ll be extremely familiar with what’s offered. That said, if you played previous games you’ll also recognize most of the games and songs. I’m glad to see a lot of these return, but I’m just as disappointment that the amount of new content seems incredibly light. I’d have loved for a more even ratio of new content to old, or new songs to go along with old games that were included. The game deceives you multiple times in the length department. It’s not a terribly long game, but there’s more heft here than it lets on at first. Even after that, the replay value cannot be understated. The game encourages you to perfect each game, meaning practice! Don’t forget the Café! There’s tons of games and content not included in the story mode you can unlock here, but you’ll need to collect coins and flow orbs by perfecting games in the main game. The story mode is bare-bones, but the dialogue is fun and breaks the fourth wall repeatedly. It goes perfectly with the title’s own eccentricity and “weird”ness. It even got me connecting to the player’s companion character, Tibby. Rhythm Heaven games spread their wings with their Remixes, which challenge players to understand and recall multiple mechanics on top of a new unfamiliar beat. I felt like Megamix was weakest in this regard, with Remixes that usually seemed short and a little underwhelming. All-in-all I’d say Rhythm Heaven Megamix does it’s job as a sort of “Greatest Hits” for the Rhythm Heaven franchise. It almost feels like it was made as fan-service. Theres a good amount to please franchise veterans (even if we’ve played most of it before) and players new to beat-based gaming won’t be left unsatisfied. Here’s a caveat though, I think the audience for this title is niche, which is why I think Nintendo did the franchise a service by pushing it to digital-only. It means making the game cheaper to publish while still giving the game (and it’s fans) a chance. Rhythm-based gaming isn’t for everyone, and the $30 price tag is a bit steep for the average gamer, but it’s cult following won’t have issue with it because they already love what’s on offer. If you need some convincing be sure to try out the demo available on the Nintendo eShop.